Quarterback Matt Flynn played in five games for the Packers last season, starting four, and completed 61.4 percent of his passes for 1,146 yards with seven touchdowns and four interceptions. 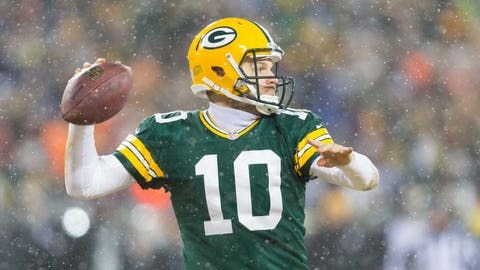 GREEN BAY, Wis. — On the same day Matt Flynn was reportedly scheduled to work out for the New York Giants, the Green Bay Packers got serious about retaining the backup quarterback who salvaged their 2013 season. According to FOX Sports’ Mike Garafolo, confirming an earlier report, Flynn re-signed with the Packers this week. The terms of the deal are not yet known. It’s been a strange couple years for Flynn, who was a backup extraordinaire in limited opportunities while playing for Green Bay from 2008-11. He performed so well in his two starts during that span (including setting multiple franchise records in Week 17 of the 2011 season) that the Seattle Seahawks signed him to a three-year contract with $10 million guaranteed early in the 2012 offseason. The situation in Seattle didn’t work out well for Flynn, who lost the starting battle to then-rookie Russell Wilson. A year later, Flynn was traded to the Oakland Raiders, where he lost the starting quarterback competition to Terrelle Pryor. When Flynn got a chance to start for the Raiders in Week 4, that didn’t go well, either. It went so poorly, in fact, that Oakland released him a week later. Three weeks with the Buffalo Bills midway through the 2013 season also weren’t the answer to turning around Flynn’s career. However, all of that disappointment for Flynn was just setting the stage for a reunion with the Packers. After injuries to starter Aaron Rodgers and backup Seneca Wallace, Flynn worked out for Green Bay on Nov. 12 and signed that same day. "He looks like he’s never left," coach Mike McCarthy said at the time. "We were talking, he said he left here January 2012, and it seems like he’s been gone 10 years because, obviously, the experiences that he’s been through." When practice-squad call-up Scott Tolzien struggled as the Packers’ starter in Week 12 against the Minnesota Vikings, Flynn got the call off the bench in the second half. In front of a pro-Flynn Lambeau Field crowd, he brought Green Bay back from a 20-7 deficit and forced a tie in overtime. Flynn started the next four games for the Packers while Rodgers recovered from a broken left collarbone, and Green Bay’s 2-2 record in those games was enough to keep the team in playoff contention. "Matt did a lot of good things," McCarthy said on Dec. 26. "Matt just kept getting better. You talk about someone who wasn’t here in training camp, was in three different offenses this year before he got here. Things have changed since he left, but I was pleased with what Matt did for us." McCarthy later added, "Matt, he’s had some highs and he’s had some lows the last couple years, and he’s stayed steady throughout everything. To be able to come in here after what he’s gone through and be able to step up and fight and give us a chance to win games and keep us in games, I think it says a lot about him. Hats off to Matt." Flynn will be the presumed No. 2 quarterback on the Packers’ depth chart heading into the 2014 season, but Tolzien is still around and McCarthy discussed his desire to draft a quarterback this year.